Have you ever thought how to share sympathy card messages to the mourning people who lost their loved ones? Words of a condolence letter may not remove but will certainly reduce the pain of your grieving friend, coworker, teacher, neighbor or relative. Don’t hesitate from sharing sympathy note and comfort the survivor. Your consoling words can be the reflection of the sorrow and worry for the bereaved. It is a better idea to write down the sympathy thoughts and lines with a soothing touch in a blank sheet first. After that, bring a printed page or blank card and jot down the reassuring thoughts including additional brief note in the card. You may carry the note with a sympathy gift or a flower bouquet while visiting the crematorium. You may also send the sympathy messages via email or by post if you are living far from the bereft family. Remember that your condolence note should sound heartfelt and natural which can ease the pain of the survivor and send it in a prompt time. Begin the sympathy letter with a warm console and acknowledge the loss of the bereaved. Send your prayers for the individual and the family by the sympathy note. Show your worry for the bereft in the difficult period through the condolence message. Add brief and personal story about the deceased in the sympathy letter. Cherish the sweet memories of the departed person in the sympathy card. Praise the noble and positive deeds of the demised in your note. Show the value and impact of the departed person in your life through the message. Ask the bereft to remember you by call, message or email any time. Offer your help and shoulder to cry, through the letter. You may add positive closing note about how the departed person will be missed. The personal sympathy letters should be written in an informal way by giving a personal soothing touch. The consoling lines in the letter must show affection to the bereft in a familiar way. I am honestly sorry about the loss of your dad. It will be hard for me to forget his encouraging words and support. I will really miss the family dinners and the Christmas celebration at your house. I know I cannot take away your tears, but please let me know if I can help you in any possible way. I just heard about the passing of your mom, and I want to apologize for the great loss. Her gracious smile and polite words are still engrossed in my memories. She used to accompany me while visiting the church every Sunday. The unexpected demise of such a pious soul is really hard to accept. It’s impossible to replace the void of your mother, but as an elder cousin, I promise you to be with you in every turbulent moment. I am shocked and sorrowful by the death news of your husband. I know it is the harsh truth of the destiny which is difficult to confront for you and the children. Tom was not only a good husband but a good father also, who set an excellent example for the other men in the chauvinistic society where male defines their priority as a front-runner. Your late hubby never discriminated your son and daughter and also gave you the equal rights in the family. I still remember his principle and gentle behavior. Such a noble soul should rest in peace at the arms of our Heavenly Father. I will pray for you and your children. If you need my support then please don’t hesitate to call me. I am earnestly saddened and can’t express my pain after hearing the news of Stella’s demise. Her departure has snatched your dreams and aspirations from life and made you numb. She always fulfilled every responsibility to be a good life partner. Now, it is your duty to look after your daughter in her absence and pray for the salvation and solace of her soul. I know your wife is no more, but her soul is always with you and your family. She was my best friend, and I promised her to be with you and your little angel after her departure and truly, I will keep my word. Merry was not only your sister but she was the best friend. You never used to hide anything from each other. Your fight was like Tom and Jerry and that entertained the other members of the family. Bella’s early demise has made me numb and speechless. I really don’t to how to bid goodbye to such a little girl who had just started her life. And the lifespan deceased her without any notice and took her to another world. I can understand that deep scars in your heart are hard to be healed and the space cannot be filled by anyone. But remember, my support is always with you, just recall me whenever you want. We are shocked after reading the email of the unexpected demise of your Elder brother. He was not only the pride of your dad but also played the role of a protector for you and other sisters. I always reminisce his fight with a random boy who used to tease you in your school days. You were lucky to have a brother like him. Along with you, I and my family are mournful with the accidental death of George. Just want to give you a warm hug little sister. I will really miss brother George. I know the root of your family is shaken with the demise of your grandfather. He was the role model for me and my father. I have learned ethics and honesty from him. It is truly tough to show you the oozing anguish of my heart by hearing the deadly news. The kind words and lessons of grandpa will always be engrossed in my mind. I still can’t believe that he was enjoying with us in the last Christmas. I really cannot bear your pain. His virtuous remembrance will always be with me. I am terribly sorry about the demise of your grandmother. She was the serene shade for the family. Her storytelling at night and enchanting Bible at every morning cannot be forgotten by us. I still can hear her giggling laughter, and imagine her bright eyes, silver hairs, and also feel her warm hugs. She was your granny but never differentiated us. I know her blessing is always with us and I owe my respect and love to the pure soul. May God help you to act bravely in this difficult period and hold your family. This unexpected news has stunned me, but still, I will hold your hand in this dark phase of life. Please let me stand with your family. The dreadful news has traumatized me, dear sister. I really don’t believe that our little princess is no more. I really can feel your pain for losing a daughter but trust me, as an aunt, I am also in a grief-stricken condition. I just want to pray for the tranquility and salvation of our little Julia. Death has played a very cruel game by engulfing a new-born life and making her parents lifeless. I know my words are not enough to heal your agony, but please let me and my husband know how we can help you in this mournful situation. I’d like to send my hearty condolence on the decease of your best friend Paula. She and her sister often visited our house and her jovial nature was liked by my mom also. It is really not easy to forget a friend like her. Her sweet memories will never get eloped from our hearts. I really regret your loss dear. I know it is the time to bid goodbye to Paula, but bid her farewell by pleading for the salvation of the soul to God. Whenever you feel isolated, just give me a call or visit my house. I am really shocked after hearing the death news of Sniffy. She was a cute and lovely cat. I still remember her soft coat and friendly behavior with me. Her absence will always be felt by you and your dad. May her soul rest in peace. Amen! The formal sympathy letters are generally written by addressing a person who is officially related to you. These notes must be brief and personal connotation should be avoided in the card. We are earnestly sorrowful for the accidental departure of our boss, Mr. Ethan Brown. Our profound sympathies are with you during this mournful moment. I have never seen such a noble employer in any organization. He treated us like his children rather than employees. The accidental loss has adversely affected the enterprise and the staffs. We learned lots of things from Mr. Brown. His encouraging support and dedication will always be missed. We will fulfill his dreams for the company by working hard and this will be our tribute to our boss. Please know that you and your family are in our prayers. We are traumatized and mournful for the demise of your daughter and our co-worker Sophia Jones. She was the mastermind of our development team in the organization. Her talents and skills were always praised by the staffs and managers of the company. Her unexpected decease is a great loss for our enterprise. We are truly sorry for your loss. Please let us know if we can help your family in any possible aspect. It will be an honor for us to stand with you in this period of grief. I am deeply saddened by the death news of Jacob and I would like to extend my sincere sympathy for your son on behalf of the director of IGA. Your son was highly respected by other employees and managers of the organization. People used to regard him as a visionary leader. Jacob’s contribution and dedication to the organization from 18 years will be remembered forever. I would like to contribute a little sum on his name and it will be an honor if you accept it. I pray for the solace of his honest soul. Heartily sympathy for the loss of your son and the best employee of our company. We are honestly mournful with the sad news of the passing of Mr. David Thompson, the honorable principal of St. Joseph School. His noble thoughts and ethics were the best lessons for the teachers and students at our school. It is not only your loss but the forfeiture of the entire school. Every staff and student of the institution are praying for the peace and salvation of the great soul who taught us how to live life and make correct choices. His gratitude will never be forgotten. It’s really pathetic to learn about the early demise of our professor, Mr. Richard Patterson. He will be missed by every student in the college including me. No one was as good as Richard sir. His moral lessons and noble works will always be appreciated by us after his departure. May the soul of your father and our professor rest in peace. RIP. We are shocked and grief-stricken after the demise of Alice Carver, the top student of the ninth standard. St. Gabriel. It is really tough to find such a gem student nowadays. She was not only best in academics, but also in other activities like sports, music, and dance. Such a talented child will always remain in our hearts. Her early departure is really unaccepted by us and we can understand your pain. Please recall us if you need any help from us; it will be a pleasure. May God bless the child. Amen! We are sorry to learn the unexpected death of Mr. Howard. Since the last 5 years, he was the best community leader and associate in our housing colony. We have no words to express our sympathy for the great loss of an associate and leader of the community. He was not only a good administrator but also a good member of our society. We are earnestly distressed for your loss. It will be an honor if you and your family allow us to contribute any support from our side for the crematorium. It is not necessary to write aesthetic flowery words in a sympathy letter. The main things to be included in a condolence letter are care, console, concern, empathy, and love. 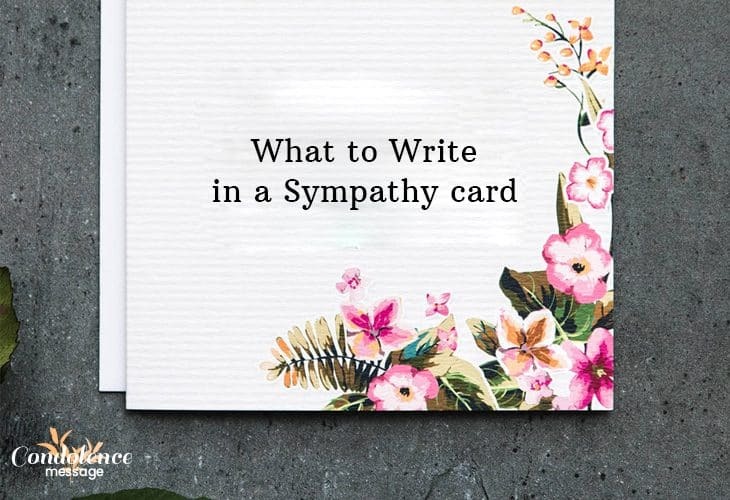 The above examples may give you a clear idea to write sympathy card messages.